Vitalizer: one strip a day, every day. Best if taken with a meal. SPECIAL OFFER through March 31 – Save $20** on Vitalizing Plan. Vitalizing Plan combines Vitalizer with the protein-rich Life Energizing Shake for a healthier, more energized you. Vitalizer provides advanced nutrition with a full spectrum of clinically supported vitamins, minerals, antioxidants, phytonutrients, omega-3 fatty acids, probiotics and more in one convenient Vita-Strip™. Uses a patented delivery system specially designed to enhance absorption of key nutrients in the body. Supports overall health including heart, joint, immune, bone, digestive, and physical energy. 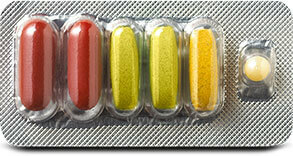 Vitalizer Women is also excellent as a prenatal/postnatal multivitamin. Vitalizer Women provides a full spectrum of nutritional support including 800 mcg of folic acid, 200 mcg of iodine and 18 mg of iron. Offer valid for purchases of Vitalizing Plan - 89384 Regular & 89404 Kosher. Actual discount varies based on price tier. Savings of $20 is at Member Price. Offer is available in the U.S. and Canada from Thursday, March 1, 2018, at 12:01 a.m. through Saturday, March 31, 2018, at 9:00 p.m. PST. Open to Guests, Members, Preferred Members, Distributors, Qualified Distributors and Associates. Business Leaders are excluded from direct participation in this offer. Eligible orders must be placed online through MyShaklee.com, Shaklee.com, Shaklee Connect™, mobile or Shaklee PWS. This offer does not apply to orders placed through the Call Center or SBOSS. Autoship orders are included in this offer with a maximum discount of $20 off Member price. Limit to one per order. Subject to cancellation at any time. Vitalizer uses Shaklee Micronutrient Advanced Release Technology (S.M.A.R.T. ), a unique, patented delivery system designed to dramatically improve absorption of key nutrients. The right nutrients, in the right place, at the right time. That’s S.M.A.R.T. Hi, I'm LINDA, your Shaklee Distributor.